The Samsung Galaxy S9 Plus has emerged from the wreckage of MWC 2018, big, bad, and ready to take on the world. But powerful and impressive though it is, it has still has its fair share of competitors, and the Apple iPhone X is chief among them. How does Samsung’s latest fare against the best Apple has to offer? We took a look to find out. The Galaxy S9 Plus comes with Qualcomm’s latest Snapdragon 845 and the power increases you’d expect from a chip that’s a faster, improved version of the Snapdragon 835. Our benchmarks of the chip in the S9 Plus show mixed results. The S9 Plus beats the iPhone X’s A11 Bionic chip by a large margin in the AnTuTu 3D Bench test, with a score of 263,591, compared to the iPhone X’s 206,010. However, the iPhone X trounces the S9 Plus in Geekbench 4, with scores of 4,231 single-core and 9,877 multi-core, compared to 2,415 single-core and 8,191 multi-core for the S9 Plus. More importantly, in real world situations, the iPhone X feels smoother. The S9 Plus has double the RAM of the iPhone X, but since Android and iOS handle RAM differently, that doesn’t mean much. Both phones offer base models with 64GB of storage. Only the iPhone offers a larger 256GB version (for $150 more) — but that’s more than offset by the MicroSD card slot in the S9 Plus. Packing a 3,500mAh battery, the S9 Plus made it through to 6 p.m. with 25-percent battery left after heavy usage. The iPhone X’s testing also saw out the day, with a similar level of battery left. Moving over to charging speeds, Samsung chose to stick with QuickCharge 2.0 for the S9 Plus, despite having the Snapdragon 845, which can support QuickCharge 4.0. It’s still able to match the fast charging of the iPhone X. Unlike the S9 Plus, however, the iPhone X does not come with a fast charger out of the box — that’ll set you back another $25 for the right cable. But at least you’ll be able to wirelessly charge with any Qi-compatible pad, as both of these devices come with Qi-standard wireless charging. The iPhone X represented a huge shift for Apple away from the established style that debuted with the iPhone 6. It’s a luxurious design, with glass laid over a stainless steel body, and a gorgeous 5.8-inch OLED panel dominating the front of the phone. The notch is a sore point, but it seems that Apple is slowly being proven right on that as Android manufacturers continue to copy the trend. By contrast, Samsung chose to refine rather than redesign with the S9 range, and it means the S9 Plus looks very similar to the S8 Plus at first glance. That’s no bad thing — it’s not an old design, and it’s gorgeous. Look closer and the changes are more obvious — the unpopular fingerprint sensor position has been shifted to below the camera lenses, and some of the front-facing tech has been made less obvious. It has the same glass over aluminum build that gives the device a pleasing amount of heft, and the curved display is a thing of beauty. The Samsung phone still has a headphone jack, though the influence of that port continues to wane as more and more manufacturers drop it. In terms of durability, you’re looking at similar results — you’ll want a case for both the iPhone X and the S9 Plus. Glass just isn’t that durable. There is some decent waterproofing on both phones, though the S9 Plus’ IP68 certification places it slightly above the iPhone X’s IP67 — we’re talking about the ability to handle 1.5 meters for half an hour compared to 1 meter for half an hour, respectively. This is a tough one to judge. These are both gorgeous phones with decent water resistance. The curved 6.2-inch AMOLED screen in the S9 Plus is every bit as bright and colorful as you could want a display to be. Apple’s 5.8-inch Super Retina AMOLED screen is not far behind, but it’s slightly smaller and slightly less sharp, with a lower pixel density. You won’t be disappointed by either, but the S9 Plus takes it. It’s dual-lens city here on these devices. The iPhone X is packing two 12-megapixel lenses, one of which is a telephoto lens with a slightly wider f/2.4 aperture, compared to the f/1.8 aperture in the standard lens. It’s a top-tier camera, worthy of its place on our top camera phones list, and capable of creating some stunning shots with bokeh effects that could easily pass as professional DSLR snaps. 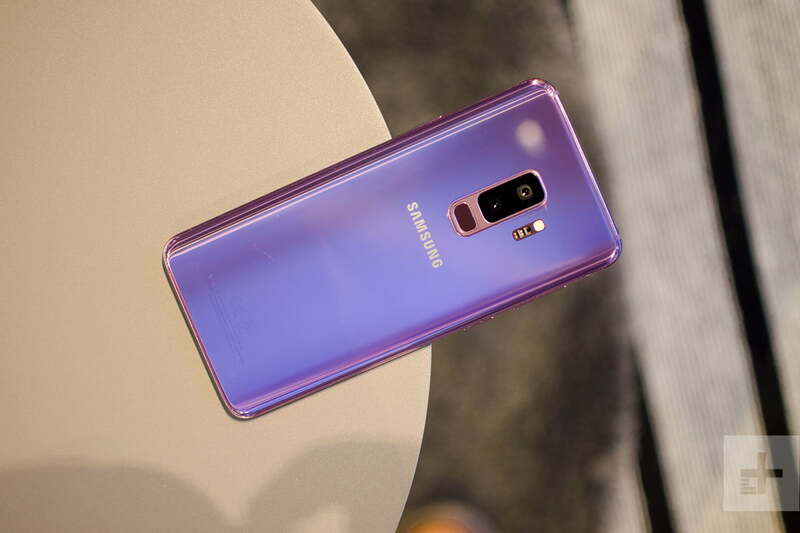 The Galaxy S9 Plus sports the S-range’s first ever dual-lens camera suite, with two 12MP lenses blinking at you from the rear. The S9 Plus’s amazing mechanical aperture can also shift between a smaller f/2.4 and larger f/1.5 aperture, delivering fantastic shots in a wide variety of light levels and locations. However, it does suffer from blurriness in portrait modes, which is one place the iPhone X excels. On the video front, these phones have similar capabilities, though the S9 Plus gains an edge with the option for super slow motion 960 fps video, while the iPhone X can only shoot at 240 fps. While the S9 Plus’ camera is a technological marvel, with the first mechanically changing aperture that we’ve seen in years and some of the best camera tech we’ve ever seen on a smartphone, it still lacks in a few areas that the iPhone X really shines in. Based on our testing so far, we can’t say that one is clearly better than the other. This one is a tie. We’re not going to get heavily into the iOS vs. Android debate here. Both operating systems have been around for long enough now that you likely know which of the two you prefer. At this point, both systems have advanced to the point where differences in presentation and design are fairly minimal anyway, so personal preference plays a larger role here than most people are likely to admit. If you’re a fan of customization, then iOS probably isn’t your bag — but Apple’s design is super slick. You’ll get AR emojis on both devices, but Apple’s implementation is better. Samsung offers a better virtual reality experience, if you want to try that out. The decider here is software updates. Apple will push out new versions of iOS to the iPhone X immediately, while you’ll need to wait for Samsung to test Google’s latest Android releases, before tweaking its own user interface to roll them out. This can mean you’ll sometimes be left waiting for the latest security updates and new features on the S9 Plus. The Galaxy S9 Plus wins points here for the Dex Station support, which allows you to turn your phone into a kind of desktop computer. But we have to give the iPhone X some kudos for Face ID, which offers a seamless unlocking experience that’s definitely slicker than Samsung’s iris scanning and more secure than face unlock. The iPhone X is currently available (but who knows for how long), and prices start at $999. Getting the 256GB model will set you back another $150, making the iPhone X cost a whole lot of pocket change. As an Apple flagship, it’s available from pretty much everywhere phones are sold, with most carriers offering some sort of package for it. The Galaxy S9 Plus began shipping on March 16. It’ll set you back $840, making it almost $200 cheaper than the iPhone X. Like the iPhone, you’ll be able to find this phone pretty much everywhere, with most U.S. carriers having their own version to sell. It’s clear which phone is the better value for money — the S9 Plus takes this final round. We’d love to sit on the fence here, but we can’t. Honestly, the S9 Plus is probably the better choice for Android fans, but the iPhone X is one heck of a machine, and one of the most gorgeous devices that Apple has ever manufactured. We marginally prefer the overall experience offered by the iPhone X, but the S9 Plus does not disappoint.